The Place There is a serious lack of good restaurants in the North-East of Singapore, and the best thing which happened in terms of dining scene over the past one year is Seletar Aerospace Park. The Summerhouse (managed by 1-Group, who is also behind Stellar at 1-Altitude and Botanico) is one of the most prominent dining destination in this JTC development, which I re-visited recently again after my visit to Wildseed Cafe last year. The most notable change is the newly introduced The Summerhouse Garden Domes, with 3 distinct interior themes of Bohemian, Scandinavian and Lounge, all fully air-conditioned, complete with own music sound system set amidst the lush garden. I must say that the whole garden dome concept feels so dreamy and unique that it is probably one of its kind in Singapore, and quite possibly one of the most romantic dining setting in town. The domes can accommodate up to 8 diners, though there is a minimum spend of S$300++ per dome booking. Well, fairy tale dining does come at a price. Other than the 3 new garden domes, The Summerhouse Dining Room now features an air-conditioned veranda overlooking the trees, which definitely makes the dining experience more comfortable on a warm day. Guests can choose from the dinner menu from The Summerhouse Dining Room at S$300++ per couple, and S$150++ per additional guest, or pre-book from the Wildseed Garden Bar with a minimum spend of S$300++. The Food One major change to the menu at The Summerhouse is the culinary direction, which used to lean towards fine dining dishes and set courses. The concept has since shifted to communal dining and sharing plates, which I feel is a positive change. We were lucky to experience the garden dome dining, which is an experience itself even before I tried the food. It was hearty to start with some good Grilled rye bread with buttermilk and housemade butter, complimentary if you order dishes from the communal dinner menu. One interesting design of the menu is that the dishes are grouped according to where the ingredients are from, with surprisingly quite a number of dishes using ingredients from obscure farms in Singapore which I am unaware of ignorantly. The first dish I tried uses eggs from Freedom Eggs in Johor, Australian avocado (S$14) with ikura, truffle pecorino, chive and sous vide egg yolk along with chia seed cracker. The complex mix of ingredients here work well for me, especially the subtle hint of the truffle flavour and bursts of ikura. The Moroccan eggplant (S$14) next has an interesting mix of mild goat cheese, leek ash, coriander oil and croutons, where the eggplant is marinated with parsley, coriander, smoked paprika, preserved lemon, chilli padi, salt, vinegar and garlic for 2 days. I am not a fan of goat cheese but I thought that its addition to the eggplant here is suitably mild and complemented the overall flavours of the dish. During this CNY season, we also had one one the most unique Yusheng presentation I have come across. The Farmers’ Yusheng (A la carte S$68 / S$88 / S$108 each) here resembles nothing like the conventional version, as it looks like planted crops straight from the edible garden. The earthy looking soil is in fact earth mixed nuts and mushroom soil, topped with fish like citrus cured salmon and smoked sea bass from Seafood Culture. The colourful vegetables are fermented carrot, butterhead lettuce and pickled beetroot from Oh Chin Huat Farm. Even the tossing of Yusheng is uniquely crafted, as we were handed mini shovels to toss to prosperity. The concept is innovative no doubt, though I still prefer the traditional Yusheng flavours. Another surprise dish which uses its main ingredient from Singapore is the snapper. The Smoked butter poached red snapper fillet (S$42) with grilled asparagus and seaweed beurre blanc comes from Seafood Culture, while the charcoal grilled asparagus is from Australia. I enjoyed the beurre blanc sauce the most which contains ingredients like mirin and bonito, a delicious touch to the fresh snapper fillet flavour. Another local produce seen in the next dish is the lobster from Seafood Culture as well for the Charcoal grilled slipper lobster (S$16 each) with tarragon oil, chicory and finger lime. The Kelong slipper lobster is first sous vide, then grilled in an Inka oven, and subsequently spread with toasted hazelnut butter. The lobster is amazingly fresh, with a nice buttery flavour to accentuate the taste. For meats, the Pickled and slow cooked lamb shoulder (S$34) with kumquat chutney, sweet potato and sage beurre noisette is very tender without any of the usual gaminess of lamb. In comparison to the lamb, I personally will go for the Wood-fired free range French Poulet (S$28) with stuffing, cranberry gel and potato confit. This dish uses local chicken from Toh Thye San Farm, served with an interesting stuffing which comprises of brioche, chicken stock, roasted pistachios, salt and pepper, after which it is moulded into a patty and seared with butter. That said, one rant is that the chicken meat leans towards the dry side, and it will be much better if it is even more tender. That said, the half chicken size is easy for sharing. For some vegetables to share, try the Green and purple sweet potato leaves (S$14) with anchovy crème fraiche and bacon bits, with the vegetables handpicked from The Summerhouse edible garden. Otherwise, I do enjoy the Smoked potato puree (S$14) with grilled abalone mushrooms, parsley emulsion, toasted pine nuts and beef stock more. It looks like a simple mashed potato beyond its complexities, as the beef stock here is a combination of roasted beef neck, bone marrow, red wine as well as chicken stock to lend it the rich flavour. For desserts, I love the Chocolate ice cream with vanilla custard and hazelnut cookie (S$14). It is a simple presentation but just the type of dessert I enjoy having. The hazelnut cookie, made with Valrhona Itakuja 55% chocolate, is crunchy and delicious. Rants It is out of the way and world to make your way here without a car, which is also ironically the charm of the development. Will I Return Again? The Summerhouse is a destination. 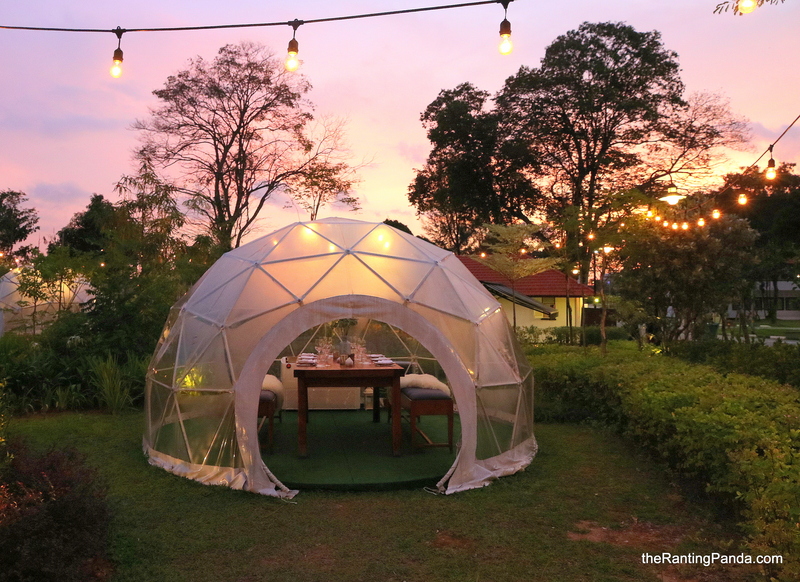 There is nothing more idyllic than the “rural” Seletar to unwind after a day’s work or the weekends, even more for the beautiful garden domes now. This is a dining venue not to be missed if you embrace nature, space and good food, under the stars no less. If you are looking for other romantic restaurants in Singapore, here is a list of our other recommendations.